The start of school is just around the corner and parents all over the world are getting ready to start shopping for all the much-needed school supplies for their children. With all the products out there to choose from, it can be overwhelming at times to try to narrow it down to a product that is a good value and fit for your child. It’s important to start their school year off with items that will help to enhance their writing skills, not hamper them. Lucky for you, STABILO has created an amazing line of products for you and your child in mind. With STABILO EASY stationery you’ll be helping your child learn to write properly from the beginning of their school years! One of the hardest parts about learning to write correctly is understanding the proper way to hold the writing utensil. Those tiny hands and fingers sometimes can have a hard time finding the proper grip! 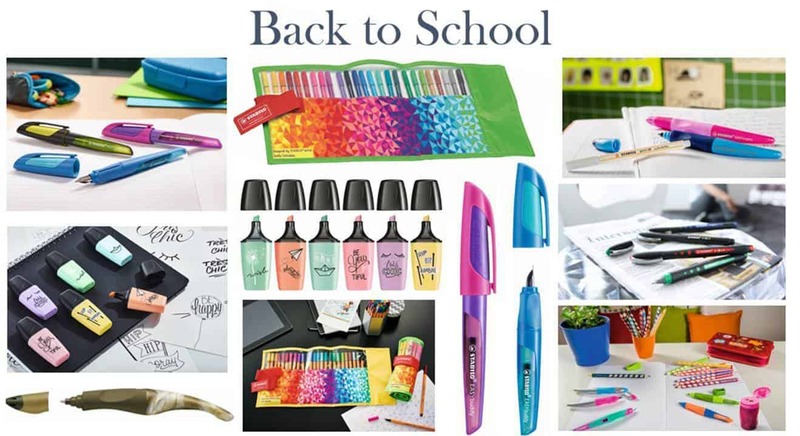 With the Ergonomic triangular tips, the shape of the pens and pencils are a more natural fit for your child’s hands. Instead of trying to find a comfortable place to hold located somewhere on the writing utensil, STABILO creates a triangular area that is not only comfortable but easy to grasp. Why not take out the guesswork and instead know with confidence that STABILO has created an EASY Start Family Pack that includes pens and pencils that were not only designed by motor skill experts but were also created for right-handed or left-handed children. Giving your child confidence from an early age about their penmanship and ability to write clearly and legibly is an amazing gift that they’ll treasure and use for the remainder of their life. It’s never to early to start working with your school-aged child on their writing skills. Not only can these pens and pencils be used for writing, drawing or doodling, but they’re created to look fun, as well as be fun to write with too! It’s time to give your child the proper writing tools to enjoy learning the beauty of handwritten homework, letters and drawing pictures and art. If they’ve been struggling in the past and complaining of their fingers hurting from their pencils or pens that they were previously using, it’s time to upgrade those old writing utensils to ones that were designed specifically with them in mind. Once your child uses the STABILO products, they’ll look forward to writing once again! Boo Roo and Tigger Too are giving one reader the chance to get ready for back to school with a bundle of STABILO stationery. Prize: STABILO Back to School bundle, which includes: STABILO beCrazy!, STABILO EASYoriginal and STABILO MINI Pastellove. Previous Post: « Last-Minute Holiday Destinations Revealed – Norfolk Travel Trends!